A lower mid-class sedan is usually chosen based on rationale. 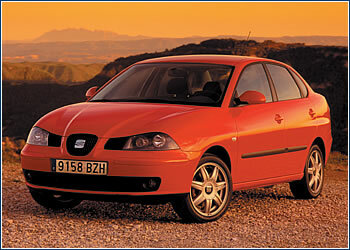 The new Seat Cordoba, with its pleasantly wolfish and sporty design, brings passion to the family car category as well. THE NEW CORDOBA, which has a 2.46-meter wheelbase and is 4.28 meters long, stands out thanks to its body’s unique lines, its strikingly shaped nose, and its high but handsome rear end with 485 liters of baggage space. 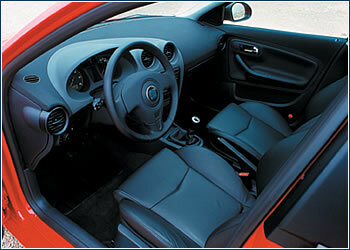 The extraordinarily thick body structure effectively protects passengers in the event of an accident. Its first-rate driving properties and outstanding handling are abetted by its DSR (Dynamic Steering Response) chassis, which takes advantage of a carefully blended combination of springs and shock absorbers, low-profile tires, and adjustable electrical-hydraulic power assist handling devices. The selection of gasoline engines begins with a three-cylinder, 1.2-liter, 64 hp (47 kW) power plant, and continues with two versions of a four-cylinder, 1.4-l motor that puts out 75 and 100 hp (55 and 74 kW), with either a four-speed automatic transmission or a standard five-speed gearbox. The three-cylinder turbo-diesel 1.4 TDi, 75 hp (55 kW) is also attractive. Besides the 1.9 SDi (64 hp/47 kW) diesel, options include a super-charged 1.9 TDi, 100 hp (74 kW) engine, which can drive a Cordoba up to 192 km/h while consuming on average five liters of fuel per 100 km. The most powerful model, the Cordoba Sport, is driven by a 1.9 TDi, 130 hp (96 kW) turbo-diesel mated to a six-speed transmission. This top-flight sedan can reach 209 km/h, sprinting from 0 to 100 km/h in 9.7 seconds, with combined consumption of 5.2 liters of diesel fuel per 100 km. The Stella model of the Seat Cordoba comes with a three-cylinder, 1.2-l engine for CZK 319,900, with a 1.9-l SDi diesel motor for CZK 371,900, and a 1.4 TDi turbo-diesel motor for CZK 414,900. Signos start at CZK 357,900, and the Sport models range from CZK 395,900 to CZK 554,900.